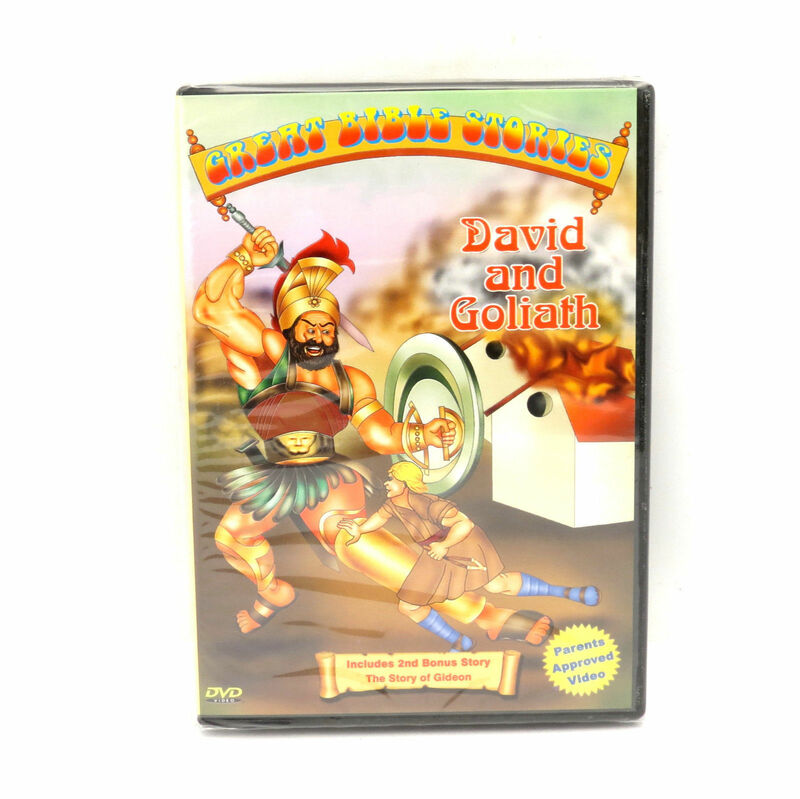 Tropical Essence Our Store About Us Contact Us Add to Favorite Sellers Great Bible Stories David and Goliath/The Story of Gideon Dvd Movies are new and sealed. DVD may be loose on the inside of case. Payment · We Accept: o PayPal o Debit Credit Cards: Visa, MasterCard, American Express, Discover. · All Florida Residents or Orders shipped to Florida must pay 7% of sales Tax. · Payment must be received within 3 days after order is placed. · Payments received with an echeck, orders will be considered paid when echeck clears; it may take 3-15 days depending on your bank. Shipping · Tropical Essence LLC Ships Worldwide. · We do not offer free shipping to International customers. USA Buyers: · We offer shipping by USPS First Class, Priority Mail and Express Mail Service. · All orders are shipped within one business day after payment is received. · We ship to Military Post Offices (MPO), Army/Air Force Post Offices (APO) and Fleet Post Offices (FPO) addresses. Since these packages are first sent to the east or west coast of the US and then shipped to military installations worldwide, keep in mind that delivery time will be longer than regular US destinations. · During Holiday Season due the high volume of packages managed by USPS, delivery time may be longer than usual, please be aware of this in order to select the correct shipping method to receive your order on time. · Our Shipping rate is based on weight and value of the order, if you have any question or concerns regarding it, Please contact us before placing your order for a shipping quote. International Buyers: · We do not offer free International shipping. · Most orders are shipped within 1 business day after payment is received. International orders using First Class Registered Mail are shipped within 1-3 business days since they need extra manual packing procedures. · Check your country shipping options and costs at the shipping and payment tab. · For Canada, United Kingdom and Australian Customers, we offer regular First Class Mail shipping method, please be aware that it does not have Tracking information or insurance option, also it usually takes 2-6 weeks for delivery depending on destination Customs and Post office process. · To all other countries we offer First Class Registered Mail, Price starts at US16.95 (and increase depending on package weight), this shipping method usually takes 2-4 weeks depending on destination Customs and Post office process and will give you limited tracking information and insurance. · We recommend Priority and Express Mail option for all International Orders; it will have full tracking and Insurance option. Usually delivery for Priority Mail takes 6-10 business days and Express Mail 3-5 business days. Please note that this delivery time will depend on Customs process and Postal service on destination. · During Holiday Season due to the high volume of packages managed by USPS, Customs and Postal Service at final destination, delivery time may be longer than usual, please be aware of this in order to select the correct shipping method to receive your order on time. · Buyer is responsible for all taxes and custom responsibilities at the destination country. · Our Shipping rate is based on weight and value of the order. · Due to German Customs Laws and policy I am unable to ship to Germany, We apologize for any inconvenience that this may cause to you, contact us with any questions. · If you have any question or concern regarding shipping of your order, Please contact us before placing it. Terms of Sale · It is strongly recommended that you know the item (color/shade) you are buying. · Shades may look different due to computer monitor settings; the color you see on the monitor will almost never match the actual item in person. · These photos are taken by a digital camera and may not show the real color of the item, they are for demonstration of the product. · You can always check manufacturer website for more reference or contact us if you have any question. Return Policy · Your Satisfaction is important to us - You may return any unopened and not used merchandise in its original condition within 14 days of receipt. · We reserve a 20% re-listing fee for any merchandise returned, Shipping and Handling is not refundable. Due to health regulations cosmetic and beauty aid items are not returnable for other reason than product defects or incorrect item received. · Please contact us to get a Return Authorization Number (RAN), It must be written on the outside of the returned package also we will provide a form that you should fill and send it with your package. Feedback · We work for a 5 Star Feedback. · If for any reason you are not going to do that, feel free to contact us first. · Our system is set up to leave a positive feedback as soon as we receive a positive one.